Not since the days of Genghis Khan has global focus been turned toward the landlocked north Asian country of Mongolia, and not since the all-conquering warrior controlled most of Eurasia around 800 years ago has the work of mankind been able to change the nation. Might sound like an exaggeration, but this is what the Oyu Tolgoi copper-gold project means to Mongolia. At Oyu Tolgoi, ore from the open pit is treated at the processing facilities to produce copper concentrate and then trucked to China. Since it was discovered in 2001 by Ivanhoe Mines, the company backed by Robert Friedland and what is now named Turquoise Hill Resources, Oyu Tolgoi has played a major role in transforming the nation. Oyu Tolgoi, which is Mongol for “turquoise hill,” has helped Mongolia become the world’s fastest growing economy in recent years…and all this during the development phase. Now that commercial production has begun, the massive operation is set to continue the nation’s growth and play a major role in the development of its people, infrastructure and business, ensuring Mongolia’s place on the world stage for generations to come. The current resource is so large that the mine is expected to be operating for at least 50 years. Rio Tinto, one of the world’s largest companies, is a major shareholder in Turquoise Hill Resources and has been actively involved since 2005, formally assuming management of the project in 2010. Operating company Oyu Tolgoi LLC is 66% owned by Turquoise Hill Resources and 34% by Erdenes Oyu Tolgoi, which is wholly owned by the Government of Mongolia. Mongolian trucks leave the Oyu Tolgoi bagging plant for the border, 80 km to the south. Copper concentrate is loaded into bags, each weighing about 2 mt, with 16 bags loaded onto each truck. Oyu Tolgoi is the largest single investment in the history of Mongolia. It will require capital investment of $6 billion, in addition to the $1 billion spent on exploration and evaluation. This is a very significant stimulus to an economy where the Gross Domestic Product was $6.2 billion in 2010. According to the International Monetary Fund (IMF), the Government of Mongolia will be the largest beneficiary from Oyu Tolgoi and will receive up to 71% of project cash flow through its ownership as well as taxes and royalties. The project is a major employer, and educator, of Mongolians. During the peak of construction, more than 15,000 people were employed, including 10,000 Mongolians. With the mine now operating, there will be a peak workforce of about 3,500, 90% of whom will be Mongolian. Indicative of its significance to date is the fact it was recently named by the government as creating the most jobs and paying the second highest taxes of all companies in 2012, even before sales commenced. Oyu Tolgoi has also developed significant infrastructure in the South Gobi, much of which will benefit local people as well as allow the mine to operate. To prepare a strong future workforce, the company is investing $126 million in education and training over five years. Copper concentrate is processed from Oyu Tolgoi’s open-pit ore. The richest part of the deposit will be accessed by an associated underground mine. Most of the orebody sits deep underground where 80% of the value lies. These high-grade deposits are the size of Manhattan Island. Even though full funding to proceed with the underground has not been approved, and is the subject of some dispute, early development has begun. Turquoise Hill’s Chief Executive Officer Kay Priestly said Oyu Tolgoi will progressively ramp up in the second half of 2013 and expects to produce between 75,000 and 85,000 metric tons (mt) of copper-in-concentrates for the year. 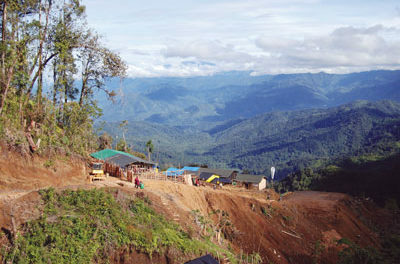 In full production, it is expected to annually produce 450,000 mt of copper and 330,000 oz of gold. She said during July the concentrator processed an average of more than 70,000 mt/d of ore and is continuing to improve. 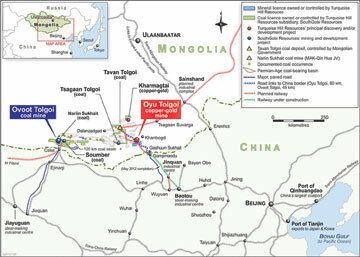 The Oyu Tolgoi copper-gold project is in the South Gobi, just 80 km from the border crossing at Gashuun-Sukhait. Commercial shipments of copper concentrate began on July 9 with the milestone marked by a ceremony attended by Mongolian government officials including Prime Minister Norovyn Altankhuyag, regional and local representatives, executives of companies involved in the project and many workers. The initial sale was about 5,800 mt of copper concentrate and the ceremony coincided with the first convoy of 16 trucks, carrying 576 mt of “Oyu Tolgoi-Product of Mongolia” concentrate departing the site bound for Gashuun-Sukhait border crossing. Rio Tinto Copper Group CEO Jean Sebastien Jacques said, “World-class, flagship mines such as Oyu Tolgoi do not start production often and I am very proud and honored to be here. On behalf of everyone in the Rio Tinto family, I would like to offer my sincere congratulations to the Oyu Tolgoi workforce, and to the people of Mongolia. “It has been a long journey, almost exactly 12 years since the first major discoveries were made. While that may seem like a long time, it is only a small portion of the years of operations we all see for its future; a future that will need everyone here to work together, to collaborate and overcome challenges we may face. It is clear that we do not invest for ourselves but for our children and grandchildren. This collaboration toward a common goal is the foundation of a good and sustainable partnership. It is what will ensure this operation, here in the South Gobi, is a mine that people around the world will see as the leader of the 21st century minerals sector. The large concentrator complex, and other storage and processing facilities, stand out in the Gobi Desert of southern Mongolia. “Joined here by many of our partners, I believe we are embarking on a long and successful journey together. 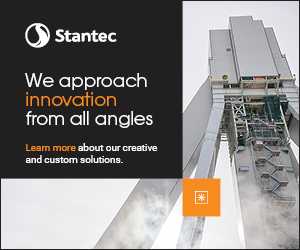 We know this process is not simple and are keenly aware of what must happen for the ore to be mined from the open pit, to be transported here to the concentrator, and the multiple steps it goes through to be turned into a viable and sellable product. But even as momentous as commencing shipping is, it is only the next step in our partnership. “After today, the next step for Oyu Tolgoi is one that is very hard to imagine without seeing. More than 1 km underground lies one of the best copper-gold ore bodies anywhere on the planet. It is high-grade, large and extremely complex. There is only one way it can be successfully mined and brought to fruition. Oyu Tolgoi’s underground block-cave mine will be one of the most advanced underground mines anywhere in the world. Rio Tinto is bringing all our expertise in block cave mining here, for employees to use. 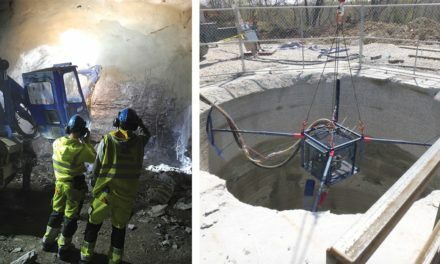 “This means applying the safest techniques possible, while also employing economical ways for Oyu Tolgoi to mine ore deeper than anyone ever has in Mongolia. It will not be an easy process and an international project financing is required to fund it, but the underground block cave is what sets this mine apart from other copper mines around the world. And it is the reason why Oyu Tolgoi is a multi-generational mine that will bring great benefits to everyone involved, directly and indirectly. “Oyu Tolgoi is not only a flagship for Rio Tinto, it must be a flagship for the people of Mongolia. We strive for it to be an example of what can be achieved, a place where people can work safely, doing something few others around the world will ever have the opportunity to experience. It means we all have a great responsibility on our shoulders and must act in the best interests of the project to ensure everyone’s mutual benefit,” Jacques added. A truck ready to dump ore mined from the Oyu Tolgoi open pit. 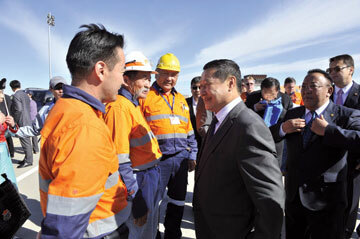 He said Oyu Tolgoi is moving from being an impressive construction project to a world-class mining operation. “Developing the underground phase is expected to increase Mongolian GDP by an additional 20% and over time directly contribute $34 billion to the Government of Mongolia. “However, building underground mines is expensive. So, even when OT begins to generate revenue from the open pit in the second half of 2013, we still need significant external funding to complete development of the 250 km of underground tunnels. Bank funding in the form of project finance is the most attractive finance option because it is cheaper and better tailored to the project than any other option currently available. I am happy to report that the process is now well advanced,” McRae said. McRae also spoke about benefits during the Mongolian Sustainable Finance Forum held in May. “In order to contribute to sustainable development and create shared value, we must start with our greatest asset—our employees. Protecting their safety and health is our top priority. Our goal is to create a work environment of zero harm. A simple principle underpins this approach—if a job cannot be done safely at Oyu Tolgoi, it will not be done. “While the journey to zero harm is long, we started by developing a corporate culture focused on health and safety. For this to be imbedded throughout the company we need to find creative ways of communicating this. For example, we recently rolled out a safety video featuring popular Mongolian rapper Quizza, rapping about key safety standards and the responsibility of each individual. The feedback received from our workforce was overwhelmingly positive. “This creative and enjoyable approach to saving lives, made here in Mongolia, has become a huge hit across Rio Tinto business units and has been translated into at least four other languages and shown on six continents,” he said. McRae told the forum that Oyu Tolgoi would eventually be responsible for around 30% of Mongolia’s GDP. “But even before we have reached commercial production, Mongolia is benefiting. Since construction commenced, we paid more than $870 million in taxes, loans and pre-payments. This contribution to the government allows it to invest upfront in sustainable development, in creating the modern infrastructure that will lead to a bright and sustainable future. Our economic benefit doesn’t just come in taxes,” he said. T. Munkhbat, D. Garamjav and S. Sanjdorj, three members of the original team who discovered Oyu Tolgoi, with Mongolian Prime Minister N. Altankhuyag and Mining Minister D. Gankhuyag at the ceremony marking commercial production at Oyu Tolgoi. “We have invested time, expertise and $126 million in education. This is training thousands of young Mongolians, constructing vocational schools, developing the curriculum and building teacher skills. This is not just benefiting mining but other sectors like engineering, construction, finance and IT—helping create a broad and sustainable economy. “It’s the same with our work to support development of a supply chain and the creation of small and local businesses in the South Gobi and beyond. By working with Mongolian companies—67% of our total suppliers in 2012—our positive impact multiplies and creates a more sustainable future for Mongolia,” McRae said. “Because of what we do and where we operate, our impact on the environment is critical,” McRae said. 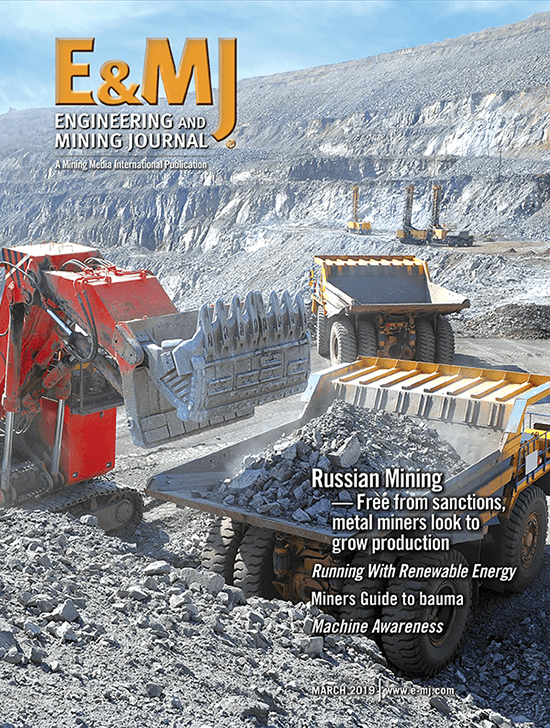 “We apply and meet tougher environmental standards than any other mine in Mongolia. Water is the Gobi’s most precious resource, so we invest in water management. We have introduced modern mining techniques that reduce water usage. We recover and recycle all domestic water and 80% of that is used in processing. “Our target is to be one of the most water efficient copper mines in the world. Of course, how we use water is monitored by us, the government and project financers. But we have taken this a step further and invited our neighbors to participate and serve as an additional watchdog. “We have established the first participatory water monitoring program in the South Gobi. It is a partnership between Oyu Tolgoi and herders in Khanbogd soum who collect data on the water in their wells and work with Oyu Tolgoi staff to identify any changes in water levels around the mine. “The Gobi is a precious and unique land. It contains flora and fauna that have survived thousands of years of some of the planet’s harshest winters and scorching desert summers. It would be a tragedy if a mine should come and undo all of that through mismanagement. We have made a solemn promise on the biodiversity of the region. Our plans for a net positive impact will ensure that when our mine is closed and gone, the nature that surrounds it will be as diverse as—and more secure—than when we first found it,” McRae said. He also spoke about Oyu Tolgoi’s closest neighbors, the South Gobi herders. He said, “They deserve our support and commitment more than anyone. We provide support in a number of ways. For example, we recently studied the potential to support development of more co-operative businesses among herder communities. There are great opportunities, with support for co-operatives to provide sustainable, economic solutions for herders. “Soon we will launch a new training scheme to support development of private veterinary medicine and improve disease control and husbandry amongst the herders,” he added. During the Mongolia Investment Summit in London earlier this year, McRae said, “In partnership with the Government of Mongolia, our workforce has created something remarkable in the Gobi Desert. From an open wilderness, with no infrastructure, in just 30 months we have built a state-of-the-art mining complex. 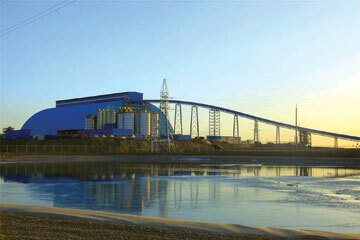 “The Oyu Tolgoi concentrator is up and running. It is the biggest machine in Mongolia. The overland conveyer, which carries the ore from the open pit to the concentrator, could run the length of London’s Kensington High Street and almost back again. Visitors find the physical scale of Oyu Tolgoi impressive, almost intimidating, but even this pales into insignificance compared with the positive human and economic impact the business will bring,” he added. 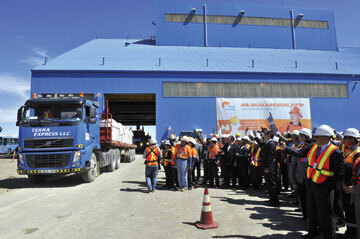 At the summit, McRae said, “It is in Oyu Tolgoi’s interests for Mongolia’s economy to flourish and diversify. But we also feel a responsibility in knowing Oyu Tolgoi needs to flourish in order to prompt others to invest—not just in mining but across other sectors. “Undoubtedly, you will have seen recent reporting of issues raised by the government around implementation of the investment agreement. Let me be clear, Oyu Tolgoi, the international investors and the Government of Mongolia all want the same thing—a world-class mine that delivers value for shareholders and a bright and prosperous future for Mongolia. “Given how crucial Oyu Tolgoi is to Mongolia, it is important that any concerns among shareholders are addressed together, between the partners, and resolved. Most importantly, the Government of Mongolia, Rio Tinto and Turquoise Hill are tackling these issues together for the long term benefit of the country and all shareholders. “Constructive progress continues to be made. And the focus is both on reviewing progress and ensuring that production and future expansions are delivered together—and that critical agreements and finance are supported. Whilst some of the issues are complex, I am confident these discussions will resolve them and we will deliver the promise of Oyu Tolgoi together. “I am confident that both Mongolia and international investors will make Oyu Tolgoi an extraordinary success story. In turn, Oyu Tolgoi’s success will be a beacon that continues to declare Mongolia an attractive investment destination. Mongolia has a bright future and its people a prosperous one. 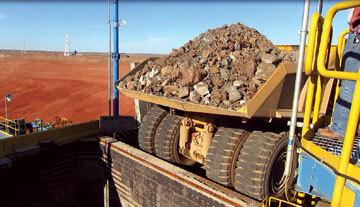 “Demand for Mongolia’s natural resources is strong. The outlook for China and India means that Rio Tinto, and I’m sure many of you, feel confident about commodity prices in the medium and long term. And Mongolia is perfectly situated, in terms of its people, resources and geography, to meet this demand, and elevate itself to be a leader on the world stage,” McRae said.